Lots of end-of-year internet usage stats are coming in. For the first time, in the US at least, Facebook surpassed Google as the most visited website. The social network site edged out Google.com (GOOG.O) with 8.9 percent of all U.S. visits between January and November 2010, while Google.com ranked second with about 7.2 percent of all visits, according to online measurement service Experian Hitwise. Facebook’s move to the top spot shows just how quickly the site has grown in popularity. Within the span of six years, Facebook has become the world’s largest Web social network with roughly half a billion users worldwide. Google.com dominated the top spot as the most visited website in the United States in 2009 and 2008. News Corp’s (NWSA.O) MySpace was the No. 1 visited website in 2007. It is ranked No. 7. However, when all of Google’s properties are considered — such as YouTube and email, for instance — Google still reigns as the most visited site at 9.9 percent between January and November 2010. Facebook follows at 8.9 percent. Yahoo (YHOO.O) and all of its properties ranked third at 8.1 percent. So connecting with others has become more important than finding things for oneself. In the language of my previous post about basic human needs and self-determination theory, the need for ‘relatedness’ has triumphed over the need for ‘autonomy’. That’s my vastly over-simplified way of looking at these huge cultural shifts! A friend introduced me to a branch of psychology called ‘self-determination theory’. 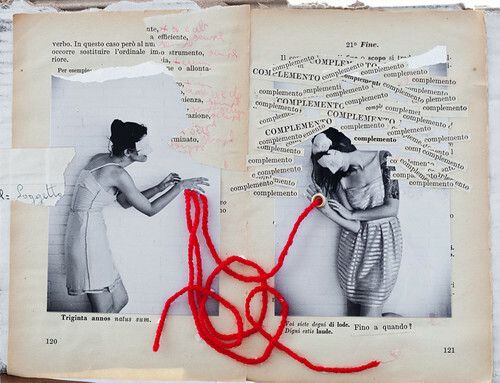 It looks at how human beings grow and mature in the context of their relationships and their social environment. The theory suggests that there are three basic needs that we all have in our journey towards psychological maturity and well-being: autonomy, relatedness, and competence. ‘Autonomy’ is our need to be ourselves, to have a sense of freedom and responsibility for who we are and for the choices we make. ‘Relatedness’ is our need to connect with others, in love and friendship; and the need to belong in wider ways, through different types of community and communication. ‘Competence’ highlights the fact that it is not enough just to discover ourselves or to belong. We also need to have a purpose, a role, a skill, something to contribute to a bigger project. It’s not just that we want to be valued in the subjective eyes of others; we also want to be objectively valuable. I found this very useful, thinking about the different kinds of social environments I have belonged to in my life, and the subtle motivations and needs that have been in play there: in my family, school, college, workplace, seminary, parish, etc. All three basic needs have been present, jostling with each other, often hardly acknowledged. What happens if one need is not met? If you have lots of personal freedom but no commitment to others? If you give and receive lots of love but have nothing worthwhile to do? If you have much to give but no-one to give it to? It struck me that the different needs are represented by our names. I know how much the tradition of naming varies in each culture. Your first name is personal. It’s not unique (there are many Stephens in the world), but it points to your individuality within your own family, to your autonomy. Your surname is your family name; it signifies your relatedness to your family in the present, and to the family as it extends back into the past – but often only on your father’s side! And many surnames used to represent your competence, your social role: Smith, Potter, Thatcher, Fisher, Cook, Bowman, Mason, etc. And what about middle names? Quite often in Britain a middle name is a way of connecting an individual with a particularly loved relation, e.g. an uncle or aunt, a grandfather and grandmother. Or it’s just another random personal name. The Chinese custom is particularly interesting. 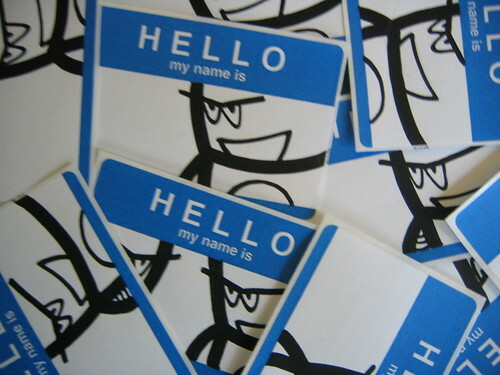 You are given a personal name, the same as in Britain. But you are also given a generational name – something we don’t have in the British tradition. It’s a name given to all the males or females in your generation, across the extended family. So if you are a boy, you share this generational name with your brothers and with all your male first cousins. If you are a girl, you share a different name with all your sisters and with all your female first cousins. It shows this extra level of relatedness within the family. The second clip is so magical I’m not sure whether it’s a spoof or not. Here is the blurb, and then watch the video. QuestVisual has released an eye-catching iOS app called Word Lens. Word Lens is an augmented reality app for the iPhone and iPod Touch (with video camera) which offers real time translation of text. You simply point your device’s video camera at a sign and the program translates and superimposes the translated text onto the video in real time. Many of you will already have seen the latest ChurchAds posters over the last couple of weeks in bus stops around the country. The campaign shows an ultrasound scan of a foetus with a halo above its head, and the words “He’s on his way: Christmas starts with Christ”. Karen McVeigh looks at some of the reactions. She quotes Mike Elms, vice-chair of ChurchAds.net. We wanted to convey that Christmas starts with Christ. That this baby was on the way. Then we thought that the scan was a way of conveying that: it is modern currency in announcing a modern birth. We put a halo on it because theologians speak of Jesus being fully human and fully divine. People are entitled to talk about it, but when the posters are put up, from the 6 till 20 December, it will be seen in context and its real message will become clear. It is an incredible piece of naivety on their part. If they are hoping to stop the secular drift away from Christmas as a Christian festival, they risk doing the opposite. It gives the impression that it was politically motivated, that they are trying to put across some sort of subliminal message. The image is too specifically associated with pro-lifers to be seen in a benign context. They should go back to angels and cribs. The advert is saying that Jesus was alive as a person before he was born. They have a halo round his head and you don’t have a halo around the head of a blob of jelly or a cluster of cells. This is not a cluster of cells… It is about the humanity of the unborn. That is a very, very powerful statement that will strike a chord with the general population. I like the poster, because it makes me think more deeply – about what it means to say that the Word became flesh; that God became a human being, dwelt in the womb of the Virgin Mary, and was born in a particular place and at a particular time in human history. What a staggering mystery. And that if Mary were walking the streets of London today, she would have an ultrasound scan of her baby in her purse to show to her family, and an appointment with the doctor to check for foetal abnormalities, and friends asking her if she was really going to go ahead with the pregnancy in this difficult situation. I just think it would have been a lot more powerful without the halo, and in fact without the words. As it is, it borders on being twee. I’d prefer it with just the scan. A grainy image of a human being in the womb, on a bus stop, in the last few days before Christmas. Leave us to puzzle out what it means and what it implies. I wonder if Terry Sanderson of the National Secular Society would have been happier if the explicit religious message had been taken away. I’m not so sure. Yes, a zebra crossing in north London has been granted Grade II status by English Heritage. Six white bands on a stretch of tarmac, which I presume have been painted over any number of times since the Fab Four walked across them in 1969, are now up there in the cultural rankings with some of the finest churches and public buildings in our land. 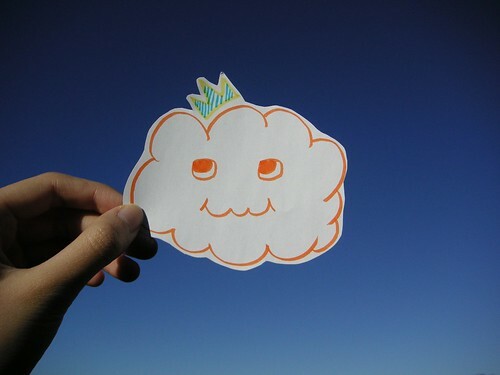 Isn’t it fantastic! I was listening to the Beatles Blue album in the car on Friday – the first time in years – and by chance my route to the M1 took me along Abbey Road, past the famous recording studios, and across the even more famous zebra crossing. I like seeing the crowds of tourists either side waiting to cross in synchronised groups of four, no-one quite sure if the rules of pedestrian crossings are active here or suspended in some kind of nostalgia-museum bubble. It’s a lovely blur of reality and hyper-reality; a magical time-capsule that can’t separate itself from the ordinariness of a London street. Here is Sam Jones’s account of the recent listing. 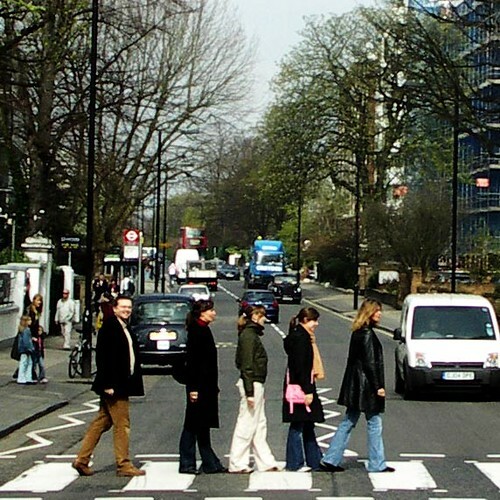 The heritage minister John Penrose took the unusual decision to protect the crossing, which provided the cover shot for Abbey Road album, following advice from English Heritage. The Abbey Road album was the last to be completed by the Beatles, although Let It Be, which had been recorded earlier, was the last to be issued. Fans flock to the crossing from every corner of the globe. On the 40th anniversary of the photoshoot on 8 August last year, hundreds of people relived the moment, causing traffic chaos in the area. Other groups who have copied the pose include Red Hot Chili Peppers. 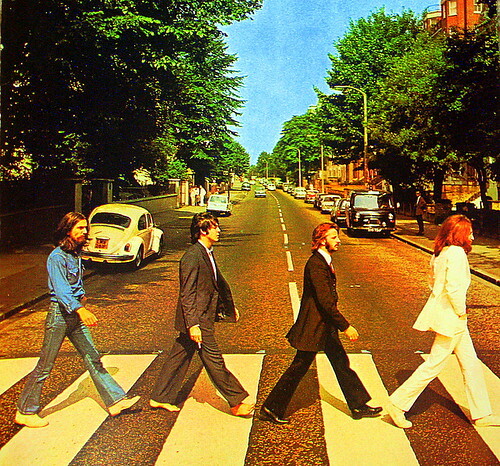 Their homage, used on the front of 1988’s The Abbey Road EP, had more in common with solo-era John Lennon than the original shot: it showed the Californian band crossing the road naked but for four strategically placed white sports socks. Google is extending its reach ‘upwards’ and ‘backwards’. The ‘upwards’ direction is into ‘the cloud’, as it encourages us to store our data and software offsite on its remote servers, instead of in our homes and offices. The ‘backwards’ direction is into cultural history, as it becomes the market leader in scanning, storing and analysing the trillions of words that have been written since the dawn of history. There are some wonderful possibilities and one or two dangers in all this. Charles Arthur reports on some of the dangers. Google’s new cloud computing ChromeOS looks like a plan “to push people into careless computing” by forcing them to store their data in the cloud rather than on machines directly under their control, warns Richard Stallman, founder of the Free Software Foundation and creator of the operating system GNU. Two years ago Stallman, a computing veteran who is a strong advocate of free software via his Free Software Foundation, warned that making extensive use of cloud computing was “worse than stupidity” because it meant a loss of control of data. Now he says he is increasingly concerned about the release by Google of its ChromeOS operating system, which is based on GNU/Linux and designed to store the minimum possible data locally. Instead it relies on a data connection to link to Google’s “cloud” of servers, which are at unknown locations, to store documents and other information. It might sound a bit paranoid, but remember that Amazon recently removed Wikileaks from its cloud computing on the grounds that they had breached its terms and conditions. Alok Jha, more positively, writes about the new science of ‘culturomics’ that has emerged to analyse the vast databases of newly scanned literature. How many words in the English language never make it into dictionaries? How has the nature of fame changed in the past 200 years? How do scientists and actors compare in their impact on popular culture? These are just some of the questions that researchers and members of the public can now answer using a new online tool developed by Google with the help of scientists at Harvard University. The massive searchable database is being hailed as the key to a new era of research in the humanities, linguistics and social sciences that has been dubbed “culturomics”. The database comprises more than 5m books – both fiction and non-fiction – published between 1800 and 2000, representing around 4% of all the books ever printed. Dr Jean-Baptiste Michel and Dr Erez Lieberman Aiden of Harvard University have developed the search tool, which they say will give researchers the ability to quantify a huge range of cultural trends in history. What can it actually do? Just take two examples. First, an analysis of the changing nature of fame over the last two centuries. Another example: tracking censorship across different cultures. The database can also identify patterns of censorship in the literature of individual countries. The Jewish artist Marc Chagall, for example, was mentioned only once in the entire German literature from 1936 to 1944, even though his appearance in English-language books grew around fivefold in the same period. There is also evidence of censorship in Chinese literature when it comes to Tiananmen Square and in Russian books with regard to Leon Trotsky. Google will know us better than we know ourselves. Although that is probably already true just from its analysis of what we have searched for over the last few months. How do you make sense of a radical commitment to poverty, chastity and obedience in the contemporary world? Is it possible for someone to say: “For love of Jesus Christ, and in answer to his call, I desire to give myself to him, freely and forever, and to devote my whole life to the extension of his Kingdom”? It was good to be with Sister Cathy Mary of the Holy Spirit on Saturday, as she said these very words and made her final vows in the Congregation of the Religious of the Assumption in their beautifully restored chapel in Kensington. You can see their website here. I’ve already posted about the renewal of religious life in this country, and one of the many encouraging signs on Saturday was the number of young religious sisters from other congregations who were there to support Sr Cathy. It takes time for God’s deepest desire for you to become your own deepest desire for yourself. That’s why, quite often, when we make a heartfelt prayer to God that he would reveal our true vocation, the answer doesn’t always come straight away. It’s not just that we aren’t ready to hear; sometimes we aren’t ready to want what God wants, or to want what he wants us to want. Second, he spoke about a scene from the film Of Gods and Men, which I haven’t seen yet. One of the monks is agonising about whether he should stay in the Algerian monastery and risk giving his life as a martyr. In response his abbot says something like, ‘But you have already given your life without reservation to God in your monastic vows’. And the monk is overcome with a sense of clarity and peace about his desire to remain where he is – whatever the cost. Fr Matt drew out from this a profound thought about the nature of commitment: that instead of acting as a restraint, which is what we often fear, it actually gives you a greater freedom. When you make an unconditional ‘yes’ (e.g., to Christ, or to a specific vocation, or to a husband or wife), it means you have already accepted all the future commitments that come along implicitly with this original commitment. Some, of course, will be difficult; some will be unexpected; some will even seem to stretch the meaning of that ‘yes’ in ways that seemed unimaginable at the beginning. But they will all be part of the same decision to give oneself completely. This gives an enormous freedom and security. There will be incredibly difficult choices to make, but the fundamental one has already been made. And that takes away the existential anguish of constantly having to reconsider whether this purpose, this deepest commitment, is actually worthwhile or not. 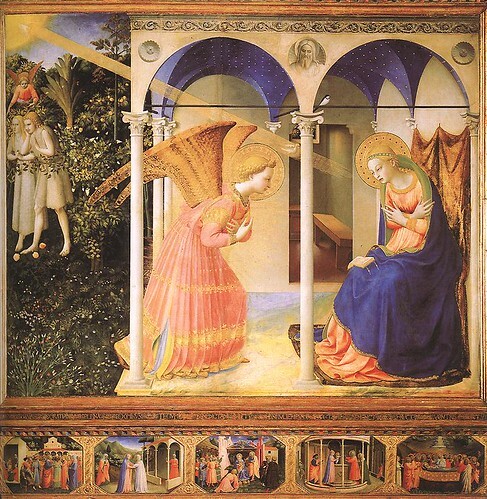 The final thought was about the Gospel reading, which was the story of the Annunciation – when the Angel Gabriel comes to the Virgin Mary and announces that she will give birth to the Son of God. 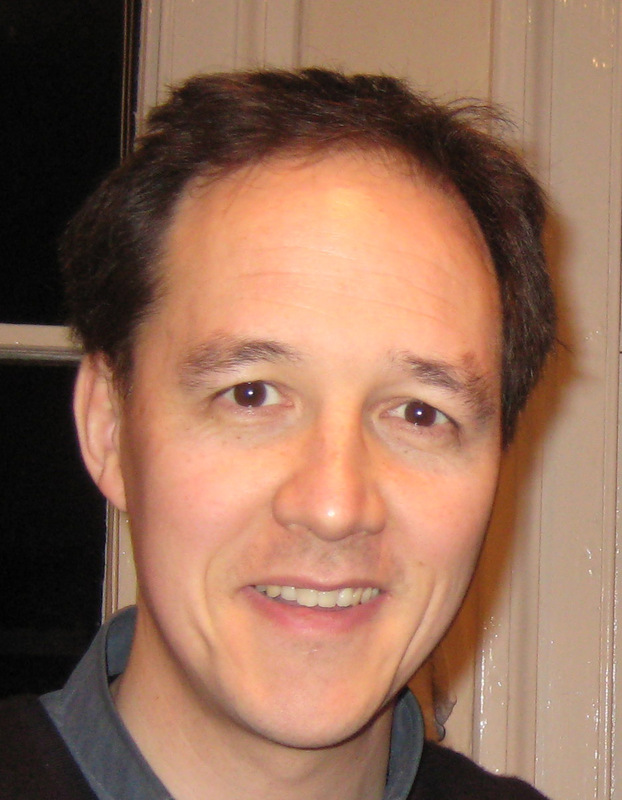 Fr Matt said “I’ve always thought that the most important line in the whole passage is…” – and we all started guessing whether it would be one of Gabriel’s profound words to Mary or Mary’s profound words to Gabriel. But he went on “…the most important line in the whole passage is the last one: And the angel left her. That threw me. I must have heard this passage a hundred times, but not once have I thought about that last line. It doesn’t mean, said Fr Matt, that God ever abandons anyone, or that the gift of his Holy Spirit is ever taken away from those who are trying to be faithful to Christ in their vocation. But the glory that surrounds the event, even the clarity and inspiration that made the commitment possible – these can fade and sometimes disappear. What endures is the commitment itself. We don’t know if the Virgin Mary ever saw the angel again in her lifetime, but she treasured his memory and clung to the truth that he had revealed. I don’t think Fr Matt was being pessimistic about Sr Cathy’s future by drawing attention to this line. He was just speaking from his experience of religious life, and in his own way he was offering encouragement: You’ve had a wonderful day professing your final vows, now you can get on with the business of living them. Following on from your reflections on the angel… in PierPaolo Pasolini’s film the Gospel According to St Matthew, Mary does meet the angel again, 33 years later at the tomb of her son, now risen from the dead. There is a lovely look of recognition on her face, and, finally, understanding of everything the angel had told her all those years ago. You can subscribe to the blog via Twitter by clicking here. Here is the one single thing that you need to do to discover your vocation. But what actually happened to the Fourth Wise Man?! But how did the shepherds actually find the manger on Christmas night? Seven big reasons not to go to Confession. And one even bigger reason to get up and go. What does it mean for Christ the King to reign and rule in our lives? As far as I know none of the image use in this blog is against copyright law. Images copied here are either (i) my own or (ii) out of copyright or (iii) used under a Creative Commons License [CCL], which means (roughly, usually) that the photographer (or copyright owner) has agreed the unedited image can be used non-commercially with proper attribution. If I mark an image as CCL it means that I have used the image under a CCL; it does not mean that I am now licensing this image with a CCL.